Deciding that you want to work with a full service exhibit company is about having control over the quality of the end result, and whether or not that is important to you. With a full service display company you can ensure the quality, the ability to create a customized look, and the customer support you get from your chosen vendor. When a display company subs out some of it’s services they, and you, lose some of the control over the final product. As the end user, you are now dealing with a middle man. A full service exhibit house should have a showroom with a range of display systems and custom elements that they incorporate into their trade show displays. They should also be able to walk you through the products in the initial conversation, determining what system works best for your exhibiting goals. The ability to “kick the tires” will help you with your decision making process. They should have an in-house graphic designer who specializes in large format trade show graphic design. Their designer should have the ability to create templates for client design files and create outstanding designs to represent your company's brand. The ability to create 3D renderings of your future booth (whether a custom 20'x20' or modular 10'x10'), are a must in trade show display design. A true full service display company will have their own in-house printing. Out sourcing to other shops leaves your project vulnerable and with room for error. What if you pick up your display and realize the logo color is wrong or your website address is spelt incorrectly? Do they have a full carpentry shop? They should have their own in-house custom fabrication department which includes all the basics needed to custom build or fix your hardware. You can’t say you build exhibits if you don’t have the space, tools and skilled labour to do so. A full service display company will be able to prepare all your show documents. They can create floor plans for electrical and rigging, order material and handling, organize shipping and prepare the customs documentation. Do you know what the tariff code for a trade show display is? They should! A full service trade show display company will have full time installation and dismantle crews experienced in setting up a wide range of different display systems. Their display installation and dismantle team should be confident to answer any questions you may have on the show floor and know the layout of your booth without question. They will have established relationships with shipping companies, experienced in transporting exhibits to and from trade show venues. They will also be familiar with timed deliveries that are often required. 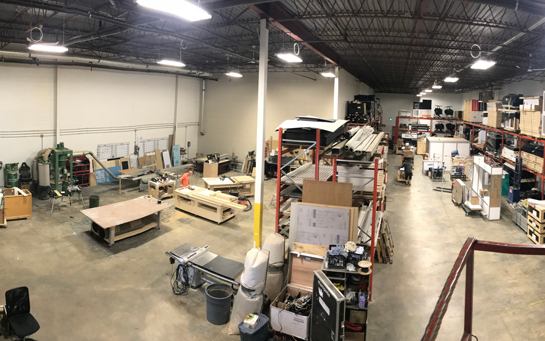 A full service exhibit house will have its own private storage facility and if your volume of display materials is extensive, they will be able to provide you with an inventory control program. Having a single source for all your exhibit needs helps make everything easier and less stressful. Why try to manage the multiple aspects of designing, printing, fabricating, shipping and installing a trade show display through utilizing numerous vendors in hopes of saving a few bucks? At the end of the day, using a full service exhibit house will most likely save you time, energy, money and that dreaded headache! Check out our break down on five popular modular display systems by downloading our free eBook!